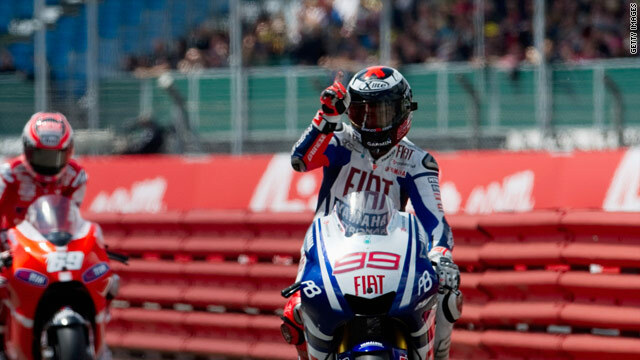 Lorenzo signals victory as he takes the checkered flag at Silverstone. (CNN) -- Spain's Jorge Lorenzo extended his lead in the MotoGP title race with a commanding victory in the British round at Silverstone on Sunday. The Yamaha rider was claiming his third win of the season and had a near seven seconds advantage over runner-up Andrea Dovizioso of Italy on his Honda. Ben Spies of the United States took the final podium position. It leaves Lorenzo with a 37-point lead over Dovizioso in the title race for which he now looks a warm favorite after his teammate Valentino Rossi broke his leg at Mugello a fortnight ago. Defending champion Rossi is set to be sidelined for at least three months and Lorenzo is aware that Yamaha hopes now rest with him. "It was a very important day. It was a race where it was easy to crash and make a mistake but I concentrated hard and won the race," he told the official MotoGP website. Lorenzo, who started from pole position, swapped the lead twice with fellow Spaniard Dani Pedrosa on the opening lap, but had things his own way thereafter. Pedrosa faded to finish eighth while other established big names were also out of the leading positions. 2006 world champion Nicky Hayden held third place on his Ducati until being passed by compatriot Spies on the final lap. Casey Stoner, the 2007 title winner, finished just behind his teammate Hayden, with Frenchman Randy de Puniet in sixth. France's Jules Cluzel won the earlier Moto2 race with Spaniard Marc Marquez, riding a Derbi, winning the 125cc category.